Causes, symptoms, and treatment for paralysis. Paralysis is the loss of the ability to move (and sometimes to feel anything in) a part of the body. Partial or slight paralysis that does not involve a complete loss of use is called paresis. 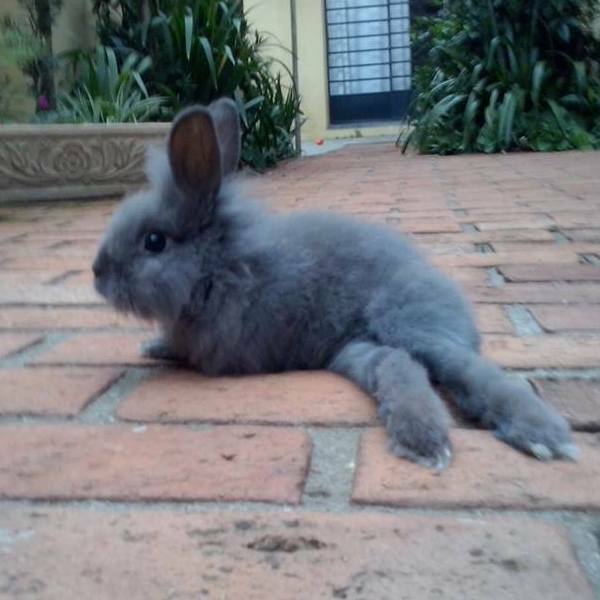 This page will primarily refer to paralysis and/or paresis of the hind legs as this is the most common form of paralysis in rabbits. Trauma: Rabbits have incredibly fragile spines. They are very susceptible to injury and, in severe cases, can be fractured or even severed completely. Any kind of trauma to the spine can lead to partial or complete paralysis of the hind limbs. An injury to the spine commonly happens when a rabbit is restrained improperly and kicks or twists out of the arms of the person holding them. Sometimes, they kick or twist with such force that it bruises, fractures or severs the spine. A rabbit can also suffer spinal damage when dropped. In rarer cases, damage can occur when a rabbit is hopping or playing, or if they are injured by a large animal (such as a dog or coyote). In addition to paralysis, trauma to the spine can also result in a loss of bladder and bowel control. This can be temporary or permanent, depending on the level of the damage. Spondylosis: Spondylosis is a condition in which the vertebrae in the spine (particularly in the lower back) develop bony protrusions that can eventually bridge one vertebrae to another vertebrae and fuse the two together. This fusion stiffens the spine, thereby reducing flexibility and making it harder for a rabbit to move around. Spondylosis often progresses gradually (it can sometimes take years for symptoms to become noticeable) and is degenerative, meaning it often worsens with time. It is thought to be a result of aging as it is most common in older rabbits, but it can be exacerbated by obesity and a general lack of exercise throughout the lifetime. This condition can cause pain as the vertebrae rub together and can cause hind limb paralysis if it progresses far enough. Arthritis: Arthritis is painful inflammation and stiffness of the joints. It is generally a result of age, though it can also be caused by an injury, a genetic condition or, in some cases, even obesity. Arthritis can lead to balance problems, stiffness, difficulty moving, stumbling, slower movement and hind end weakness. Encephalitozoon cuniculi (e. cuniculi): Encephalitozoon cuniculi is a parasite that attacks a rabbit's central nervous system (the brain and spinal cord). It is transmitted through exposure to the urine of infected rabbits or through the placenta when a rabbit is born to an infected mother. When it enters the body, e. cuniculi travels through the blood stream and body tissues and targets organs such as the heart, lungs and liver. Eventually, it can make its way to the brain, kidneys and eyes. The body's immune response will create antibodies to fight the infection by limiting tissue damage and preventing the parasites from multiplying. Some infected rabbits may never show symptoms and live normal lives. Others, often when faced with some kind of stress that suppresses their immune system (such as an illness, injury or disability), may start to experience more overt symptoms. E. cuniculi is the most common cause of head tilt (and often causes head tilt symptoms), but it can also lead to hind end weakness and/or partial paralysis. Paralysis can also occur throughout the rest of the body. A stroke can lead to paralysis in the face or side and various degenerative conditions can lead to paralysis in the front legs. How Do You Treat Paralysis? Trauma: If you suspect that your rabbit has sustained trauma to their spine, get them to a qualified veterinarian IMMEDIATELY. Prompt medical attention is absolutely critical and will make a significant difference in your rabbit's recovery. Do not handle them unless absolutely necessary and, when necessary, do so as little and as gently as you can. Set a carrier next to them. If your carrier has a removable top, take the top off. Place a soft towel or a fleece blanket on the floor or the carrier. Pick your rabbit up very gently with one hand supporting the front of their body and the other supporting the back. Do not lift your bunny from their stomach and let their back legs dangle. If necessary, ask someone else to help you. It is very important that you keep your rabbit's body as supported and as level as possible while you move them. Place them securely in the carrier. Ideally, you want their back legs to tuck under them in a normal resting position. However, if they do not sit that way naturally, do not manipulate them into that position. Once they are in the carrier, roll up a towel and brace their sides. Then keep them as still as possible while you transport them to the vet. If you can, call the hospital once you are on your way and let them know you have an emergency with your rabbit and how long it will be until you arrive. Once you get to your vet, they will administer an injectable anti-inflammatory, give your rabbit pain medication and conduct x-rays. Your vet will then talk with you about the injury- its location, the extent of the damage, the results and your rabbit's possibility to heal. Depending on the severity of the injury, your vet may discuss your rabbit's quality of life going forward. There isn't much, medically, that can be done to "fix" trauma to the spine. There are some specialized surgical procedures that can be done in an attempt to correct an injury, but they are risky and rarely are they successful in restoring hind end mobility. When your rabbit is stable (which may take an overnight stay), you will be allowed to take them home. You will be instructed to keep them confined for a period of about 6 weeks to allow for healing. You will also receive pain and anti-inflammatory medication to take home which you will have to administer (usually) twice a day. Depending on the type of injury and the severity of the damage, your rabbit may or may not recover the use of their hind legs. If the damage was mild to moderate (such as bruising or a slight break), especially if they retain some sensation in their toes, there is a chance that they will heal and perhaps even be able to walk and hop again. If the damage was more severe, as in the case of a spine that has been completely severed, the chance of them regaining the use of their hind legs is slim to none. After the initial 6 week healing period, your vet will take follow-up x-rays and reevaluate your rabbit. If the spine looks stable, you may talk about pursuing physical therapy and alternative therapies such as acupuncture and laser therapy if these are options you are interested in. The entire recovery process will take about 6 months. Spondylosis: Spondylosis is diagnosed with the use of x-rays, which will show bony formations and changes on the spine. Once diagnosed, spondylosis is most commonly managed with pain and anti-inflammatory medications. In some advanced or more serious cases, corticosteroids may be administered. Some alternative and physical therapies, such as acupuncture and chiropractic treatments, can be helpful for rabbits with spondylosis (see our Massage and Physical Therapy pages for more information on those topics). Arthritis: Your veterinarian will diagnose arthritis through a physical examination. They will take the joints through a normal range of motion, check for pain reactions, observe the reflexes and determine muscle strength. They will take x-rays and look for signs of joint and bone deterioration and signs of inflammation. Initial treatment consists of rest and medication to reduce pain and inflammation. Long term arthritis treatment centers around slowing arthritis formation, strengthening and protecting the joints and controlling pain. Techniques for long term arthritis management include supplements such as glucosamine and chondroitin, long term medication and massage therapy. See our Massage page for more information on that topic, as well as our Arthritis page for more information on arthritis management. Encephalitozoon cuniculi (e. cuniculi): If your rabbit has hind end weakness and x-rays have ruled out physical ailments such as trauma, spondylosis and arthritis, your vet will then look at e. cuniculi as a possible cause. To test for the infection, your vet will conduct a urinalysis and blood tests. Part of the blood testing will include a blood titer test, which analyzes the blood for the presence of antibodies against e. cuniculi. While this can only reveal whether the rabbit has been exposed to the parasite, high titer levels could indicate that the rabbit is fighting off infection and validate treatment. Even if testing is inconclusive, treatment is often pursued if e. cuniculi is suspected. This includes anti-parasitic medication (usually Panacur, or fenbendazole) and anti-inflammatory medication. E. cuniculi is not curable, but treatment can stop the progression of the disease and reduce or eliminate the clinical signs. Paralysis will require your long term care and commitment. None of the conditions we've reviewed have a quick cure. Many require weeks and even months of home care and some are conditions that your rabbit will live with for the rest of their life. While many causes of hind limb weakness can be managed, your commitment is very important to your rabbit's recovery and ability to maintain a good quality of life. When a rabbit is paralyzed to any degree, secondary problems such as urine scald, sore hocks and pressure sores are common. You should take as many preventative measures against these conditions as you can. See our pages on these health subjects in our Resources section for all the information you need to minimize and, if necessary, treat these conditions. 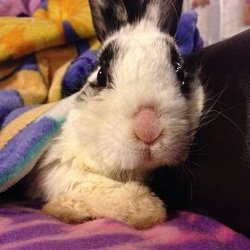 A rabbit with paralysis will require important changes to their enclosure. This includes special bedding, a low entry litter box (if they still have bowel control), and maybe even a new setup altogether. See our pages on these housing subjects in our Resources section for all the information you need to set up a comfortable and safe place for your paralyzed rabbit. If your rabbit is unable to urinate on their own, you will need to express their bladder manually. Your vet can show you how to do this. We also have some information on it on our Urine Scald page. If your rabbit struggles with or has lost control of their bladder, you will also need to give them bottom baths as needed to help them stay clean and prevent issues such as urine scald. See our Baths & Cleaning page for more information on giving your rabbit a bath. If your rabbit is having trouble eating and/or drinking on their own, you will need to adapt their dishes for easier access or provide them with assisted feeding. This can be Critical Care or other supplements fed via syringe. Visit our Supplements page for more information on diet supplements. It is important that your rabbit get enough nutrients, especially during any recovery period. Some weight loss is natural due to muscle atrophy, but keep a careful record of your rabbit's weight and be sure they are eating enough to stay healthy. If your rabbit is unable to move on their own, particularly during an initial recovery period, you will need to move them at regular intervals to prevent pressure to the lungs. Adjust their laying position and make sure there are times when they are off their chest. Rabbits with hind end paralysis will find it difficult (or impossible) to clean their ears on their own. As this is an important part of rabbit hygiene, they will require your help. Visit our Ear Care page for more information. For a rabbit with spondylosis, exercise is important for preventing muscle atrophy. If appropriate, set litter boxes or food dishes just out of reach of their regular resting areas to coax them to move (even a little) to reach them. Encourage them to play with toys or forage for treats- activities to keep their mind healthy as well as their body. For any rabbit with mobility issues, it is important that you eliminate any slippery flooring. Cover bare floors with non-slip rugs and make sure living areas have lots of padding. Heat therapy can be very soothing for rabbits with paralysis, particularly those suffering from spondylosis or arthritis. Warmth can help soothe the joints, decrease muscle tightness and increase circulation. Use a heating pad. Turn it on its lowest setting and cover it with a fleece blanket or towel. Lay your rabbit on top for about 10-15 minutes. Check your rabbit often to make sure they don't get too warm. If they are, add another layer of blankets over the pad. Never leave your rabbit unsupervised when using a heating pad. A stuffed bunny friend can be a welcome companion to a paralyzed rabbit, especially if they have had to be separated from a companion because of their condition. If your rabbit's paresis or paralysis is something that will affect them long term, consider purchasing them a wheelchair. We discuss rabbit wheelchair options on our Wheelchairs page. Regardless of cause, severity or medical recourse, paralysis in itself is NOT a death sentence. There are many little bunnies out there who are living happy lives despite the challenges they face with paralysis. 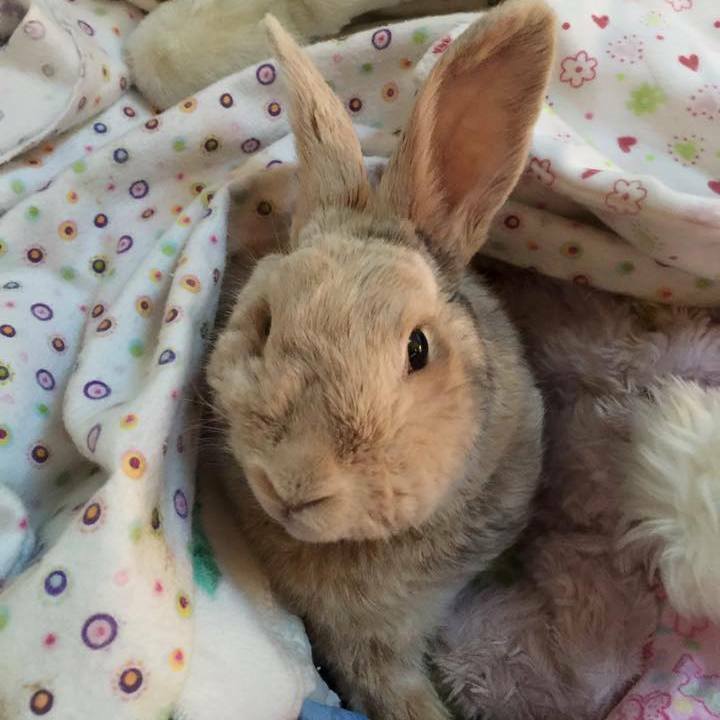 Our own spokesbunny, Bonnie, is proof that even with the slimmest chance of recovery a rabbit who faces a serious injury like a broken back CAN overcome it and still lead a full life. There are incredible resources in alternative medicine and physical therapy that can be of benefit and give your rabbit a better chance at recovery. Treatments such as acupuncture and laser therapy have a long-documented history of medical assistance in areas such as these. 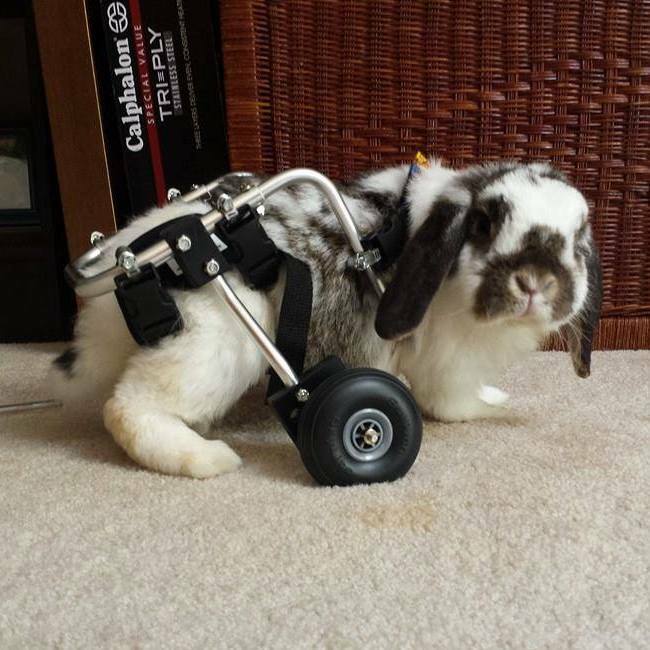 Rabbits can also adapt well to the use of wheelchairs. We urge you to pursue them if you can. Most importantly, give your rabbit a chance. They may surprise you with their strength and will to live. If they don't give up, neither should we!